Conventional wisdom be damned — young people are embracing farming. But we’re talking hydroponics, heirloom tomatoes, and small-batch goat cheese. Also, you’re as likely to find them on a laptop as a tractor. 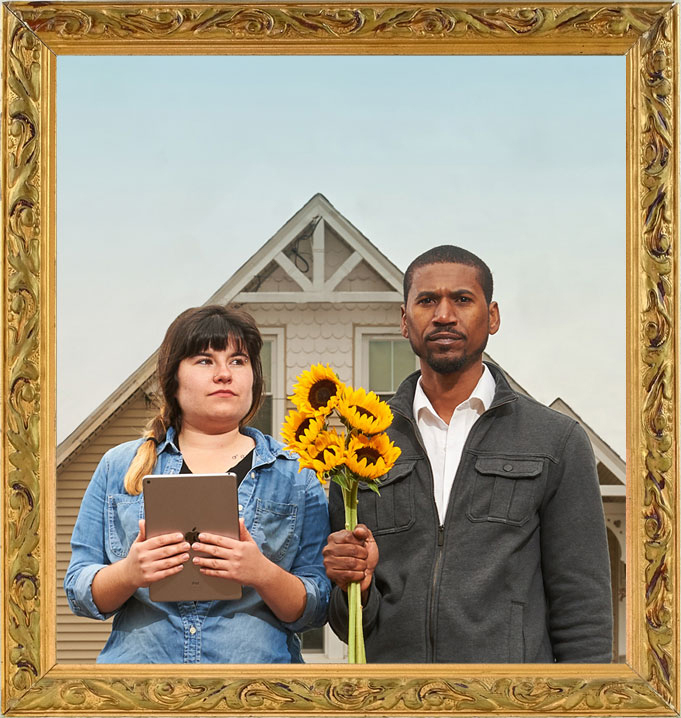 Agriculture students Marisa Kaplita and Macario Rodrigues pose “American Gothic” style at UConn’s Spring Valley Farm. If you thought farming was dead, consider this. The three-year-old Modern Farmer magazine has a digital reach well beyond a million and some 100,000 print subscribers. If you Google “how to start a farm” you get more than 3 million hits. And at UConn’s College of Agriculture, Health, and Natural Resources (CAHNR), enrollment has risen risen more than 50 percent in the past decade. It’s clear that a lot has happened since the Storrs Agricultural School was founded in 1881. For one, women were officially admitted in 1893 (there was a department of home economics) and in that same year the school — by then the Storrs Agricultural College — was granted land-grant status under the auspices of the Morrill Act, which had been passed by the U.S. Congress in 1863 to promote the teaching of practical agriculture, science, military science, and engineering. 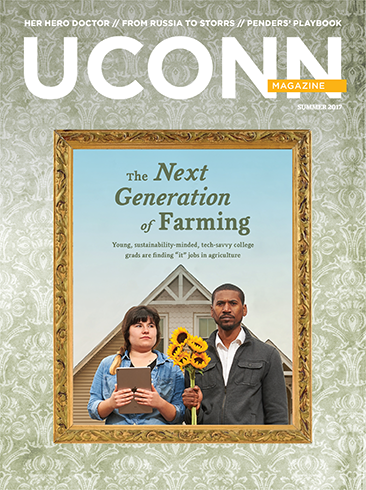 Today, UConn is one of 106 land grant colleges and universities that produce outstanding agriculture scientists and teachers, that lead in the study of biotechnology, and that have made countless advancements in scientific research in animal sciences, horticulture, nutrition, agricultural economics, environmental sustainability, and more. In Connecticut alone, the annual economic impact of agriculture, commercial fishing, forestry, and related businesses is about $4.8 billion dollars. However, the one constant Faustman sees in UConn students who are choosing careers in agriculture these days is a serious commitment to the environment. While the time-honored model of passing on the hundred-acre family farm from one generation to the next has continued to fade, in its place is a new face of agriculture. These days you’re just as likely to see a beginning farmer on a smartphone or laptop as seated on a tractor. And, locally, the harvest varies from traditional crops such as potatoes, apples, and milk to products like honey and goat cheese, maple syrup, and eggs from heirloom poultry. Many CAHNR students join the learning community EcoHouse, which provides a culture of sustainability for students who are passionate about environmental issues. A select group of students has the opportunity to live at the student-run Spring Valley Farm, which is a collaboration among EcoHouse and First Year Programs, Dining Services, Residential Life, CAHNR, the Office of Environmental Policy, and the Office of Public Engagement — a true cooperative where students sell the produce they grow to the community. Many who live there do so because they do not come from families or communities that farmed, and this is their first taste of the real thing. More and more, farming is being done by young people and not-so-young people with no prior experience in agriculture —folks with a desire to get out from behind a desk and into the fresh air. They believe in a quality of life that includes caring about the environment. They want to be self-sufficient and give back to the planet — more than they take from it. With sustainability as their mantra, these beginning farmers embrace the high-tech alongside the low-tech, using digital irrigation systems and advanced hydroponics to grow the strawberries, melons, and lettuce they place in crates and cart in pickups to the neighborhood farmers market. “There is a market for all types of ethnic foods from bok choy to lemongrass and okra to tofu made from organic soy beans, that we’re beginning to see at farmers markets everywhere,” says Faustman. It helps counteract the inherent challenge of farming in a place like New England, where land is at a premium and populations are dense. “If a new farmer can find a particular niche, then high demand can make up for less land and lower production,” says Faustman. Finding land is one of the biggest challenges in starting out in farming without a family farm to take over. But there are many more. UConn’s Department of Extension has a series of programs aimed at helping new farmers overcome those hardships. Before quitting your job, trading in office attire for blue jeans, and Googling “how to start a farm,” you might want to have a talk with Jiff Martin and her cohorts. 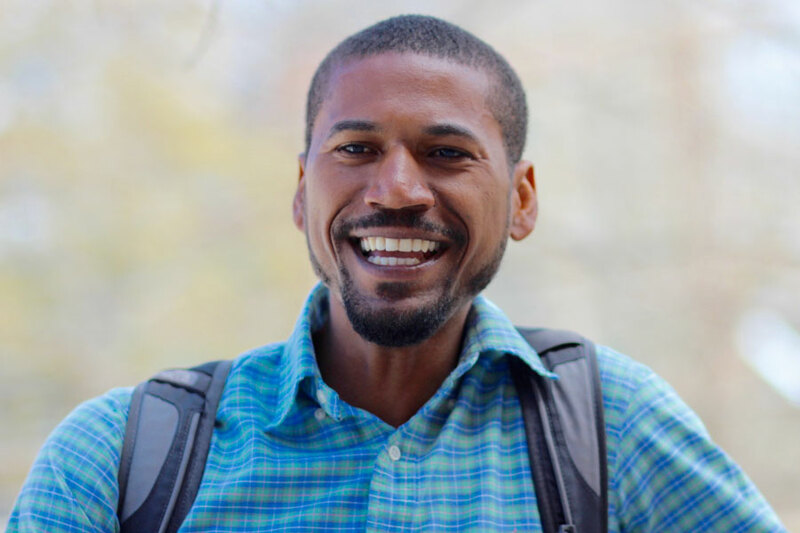 Martin is the Sustainable Food System associate educator of UConn’s Department of Extension, which is part of CAHNR. In 2015, she was recognized by the White House as a Champion of Change for Sustainable and Climate-Smart Agriculture, one of only 12 people in the country selected for the honor. So she’s got the credentials to administer a $600,000 USDA Beginning Farmer and Rancher Development Grant to support, with training and technical assistance, those who have farmed or ranched for fewer than 10 years. That can be a challenge when one of the first major hurdles is securing suitable farmland. For those wanting to grow vegetables, it’s difficult to find land not filled with rocks or overused by growing hay or silage crops. 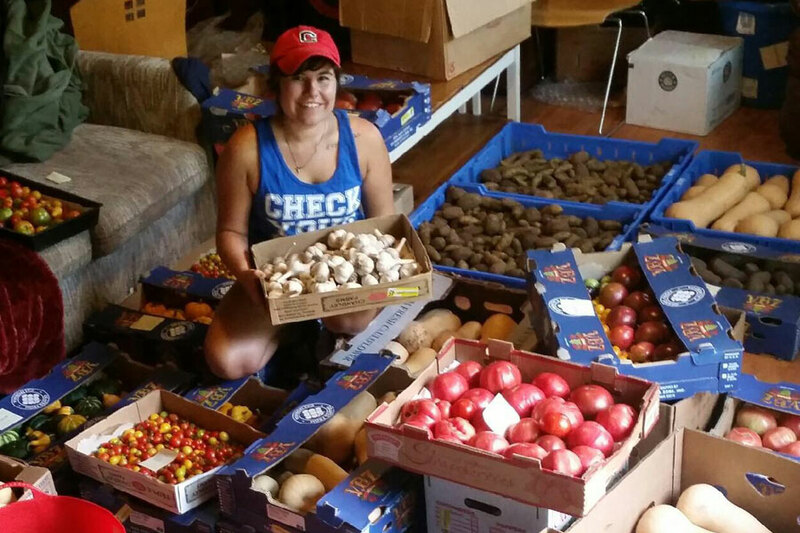 It’s tough to find a parcel big enough to yield enough produce to support a family. That’s why many farmers start out literally in their own backyards, Martin says, and why partners or spouses often need to maintain off-farm jobs that provide a regular income and health insurance. While there’s not necessarily a typical profile of the new farmers who are attempting to make a living off the land, Martin says they tend to share certain traits, desires, and needs. At UConn’s Spring Valley Farm, students grow vegetables to sell to the community. 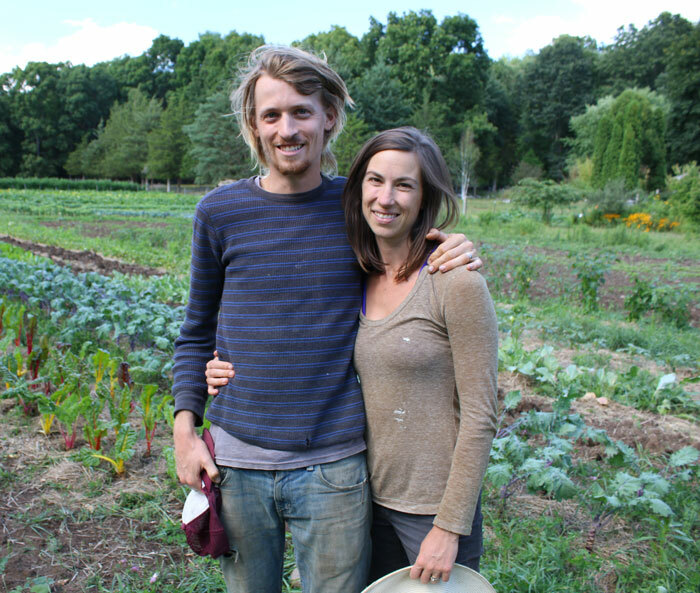 UConn Extension programs that help new farmers, whether they are alums or not, were key to helping Charlotte Ross and Jonathan Janeway grow Sweet Acre Farm. The two had been working a series of jobs since graduating from college and noticed a pattern. Both are from Connecticut and wanted to return to the state to start a farm. They knew, however, that finding land would be a hurdle. Indeed, for several years they leased land in Mansfield and Hampton before finding the six acres they now own in Lebanon. 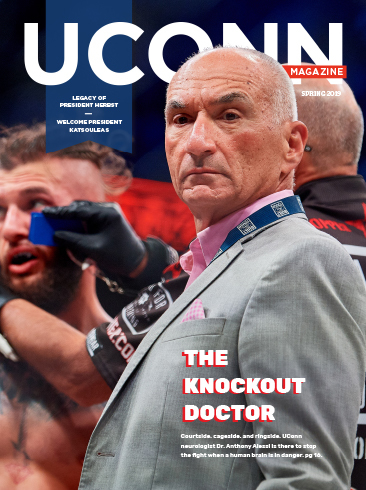 Among the assistance provided by UConn Extension has been advice on irrigation systems, organic pest control, soil assessment, and access to legal assistance when they were closing their real-estate transaction. In their third season of farming, while on rental land, the couple took advantage of the Beginning Farmer and Rancher Development Grant administered by Martin. Now firmly established, produce from Sweet Acre Farm can be found at the Willimantic Food Co-op and several local restaurants and farmers markets. And Ross now works with UConn Extension helping others get their farms off the ground. DeRosa ’17 (CAHNR) had a lot of friends who lived on farms when he was growing up in Bethany, Connecticut. And despite the fact that some of those farms had livestock, he was always drawn to working with his buddies when they tended vegetables and other crops. Taking a year off after high school, he worked doing landscaping jobs in order to help fund his education, and his attraction to plant life continued. 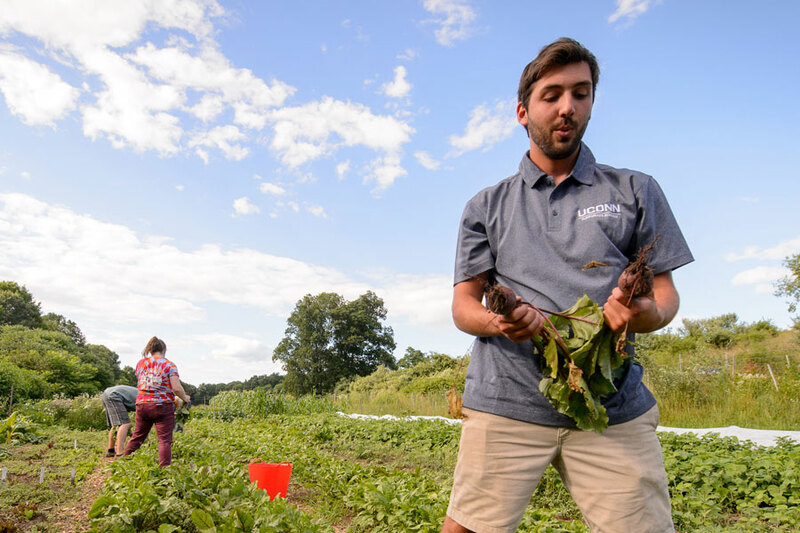 When he arrived in Storrs, DeRosa decided to major in horticulture, a choice he calls “the best decision I ever made.” He joined EcoHouse, but his first trip to Spring Valley Farm was the result of his bragging about his Italian culinary skills. A friend invited him to the farm to make pasta sauce, and they went out into the field to pick fresh tomatoes. The sauce was a success, but even more important was the impression the farm made, and in the spring of his sophomore year, he moved in. He and a friend applied for an Idea Grant to build a greenhouse there using aquaponic techniques. “We got the grant, and with the help of the Facilities Department, the greenhouse was built,” he says. The plan is to provide UConn’s Food Services with lettuce and herbs year-round. Lawlor ’17 (CAHNR) grew up in Ansonia, Connecticut, and worked at a horse boarding facility during high school. “I was bitten by the bug,” she says. Fitting in the necessary labs was a challenge for Lawlor, however, who played on the women’s basketball team (she is pictured above, front, giving teammate Katie Lou Samuelson ’19 (CLAS) a tour of the UConn Dairy Barns). The college worked with her to create an individualized major: sustainable farm and ranch management, which would mix economics and agriculture courses. “My long term goal is to have my own farm, my own business,” she says, adding that after graduation she plans to head out west for some hands-on experience where the land is bigger, more spread out. She did summer internships in the barns here and favored working with the cattle. “I like working with cows. They’re just laid back; they like doing what they do — they eat grass, they sunbathe. “We need the younger population to come in and start farming, producing,” says Lawlor. 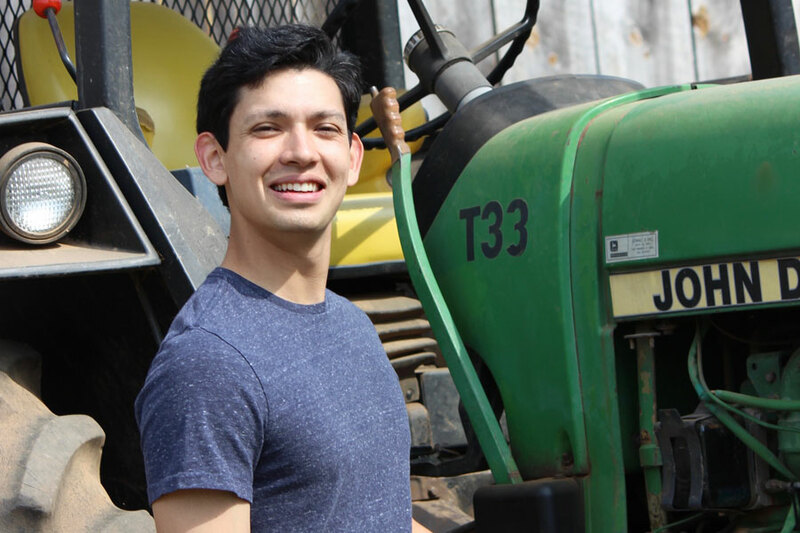 Laskos ’15 (RHSA) had set his sights on a career in agriculture by the time he graduated from the vocational/agriculture program at Trumbull High School. His original plan was to major in horticulture in CAHNR, but the benefits of the two-year program offered by The Ratcliffe Hicks School of Agriculture — with its emphasis on hands-on-learning and an extensive network of internships — led him to change course just a bit. Now, just two years after he earned his degree, he has founded Gigafarm in East Windsor, Connecticut, where he plans to grow vegetables and herbs to sell to local restaurants. There’s also the potential to grow hops (Humulus lupulus) in support of the state’s burgeoning microbrewery industry. The property Laskos purchased is the site of a former tobacco field that had become overgrown. Now cleared and ready for planting, his ultimate goal is to have a vertically integrated company that will blend hydroponics and conventional agriculture. It is not often that we think of 11-year-olds as having epiphanies, but that’s more or less what happened to Branford, Connecticut, then-sixth-grader Marisa Kaplita ’17 (CAHNR). “I was writing an article for the school paper on broiler chickens and how they are slaughtered. That turned me into a vegetarian. Then my earth science class introduced me to environmental issues, and I was hooked. I knew then and there that one day I would go to college and study environmental science,” she says. True to her word, Kaplita graduated in June as an environmental science major with a concentration in soil sciences. Her passion for sustainable living translated to a commitment to EcoHusky, the student group associated with UConn’s Office of Environmental Policy that is dedicated to making campus more environmentally friendly, and to EcoHouse, the learning community associated with Spring Valley Farm. Kaplita lived and worked on the farm during her last six semesters on campus. Her duties ran the gamut from planting seeds and weeding the plots of vegetables to harvesting the produce and preparing it for market. She is keenly aware of global issues surrounding food production and is particularly sensitive about decreasing the amount of food waste in the U.S. and other developed countries. As a youngster growing up in the Cape Verde Islands, Rodrigues ’17 (CAHNR) took for granted that all food was local. He couldn’t have imagined anything else. At 16 he moved to Massachusetts with his family and graduated from Brockton High School. A nine-year career in the U.S. Navy’s submarine service included a stint in Groton, where he set his sights on someday attending UConn. He says he found his major in sustainable agriculture by accident when a first choice fell through. Rodrigues’ goal is to have a farm and grow vegetables. And he’d like to use his knowledge to help others here and abroad establish sustainable agriculture programs that use the emerging technologies his grandparents couldn’t have imagined. Chiozzi ’17 (CAHNR) is from the shoreline town of Guilford, Connecticut. There’s no farming in his background, but he developed a keen interest in the environment during high school. Chiozzi joined EcoHouse as a freshman, started volunteering at Spring Valley Farm, and soon got a job there 10 hours a week during the school year and full time in the summer. 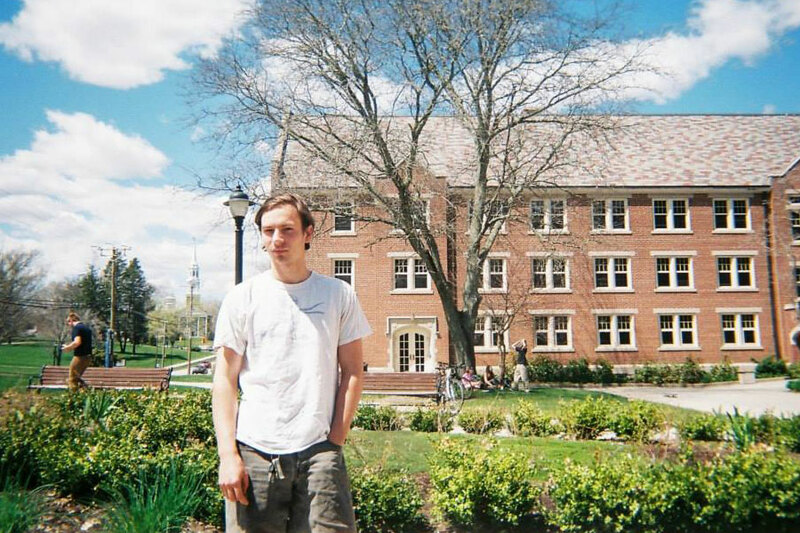 In his final semester, Chiozzi interned at Sweet Acre Farm in Lebanon, Connecticut. It was eye-opening, he says, to work with people whose livelihood is farming. “I learned things about planning and budgeting and really got a sense of what it takes to be a successful farmer,” he says.